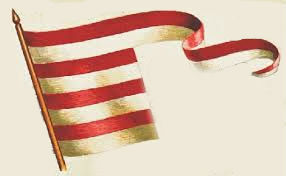 Flag of the Árpád dynasty that ruled the Principality of Hungary. Before the arrival of the Magyars (Hungarians), much of the territory of modern-day Hungary was incorporated into the Roman Empire beginning around 20 AD in the form of two provinces—Pannonia and Dacia. 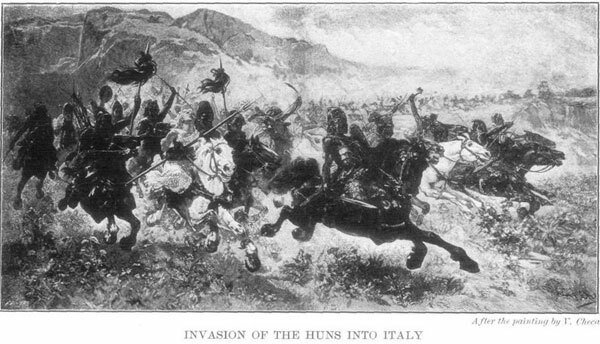 During the Great Migration Period, tribes invading the Roman Empire from the east settled on the territory of modern-day Hungary for various periods of time starting around the year 375: the Huns, Ostrogoths, Lombards, Gepids, Avars, and Slavs. With the exception of the Slavs, these tribes failed to establish long-lasting states in this territory, known in geographical terms as the Carpathian Basin. By the 800s, three states emerged to vie for control over the Carpathian Basin: East Francia (or the Kingdom of the East Franks) in the west; the Great Moravian Empire in the north; and the First Bulgarian Empire in the south. 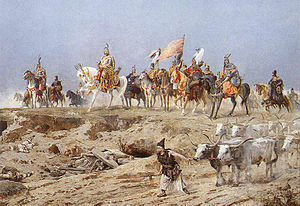 Grand Prince Árpád leads the Magyars on the conquest of their modern-day home (896 AD). The Magyars crossed the Carpathian Mountains from the east under the leadership of Grand Prince (nagyfejedelem) Árpád beginning in the year 896 to conquer the Carpathian Basin from the Bulgarians, Slavs and Franks. The Hungarians are a Finno-Ugric people originating from the Ural Mountain region of modern-day central Russia. Among modern European peoples, the Hungarians are therefore related only to the Finnish and Estonians, Finno-Uric peoples who migrated to the Baltic Sea from the same region. Unlike its predecessors from the east, the Magyar tribe managed to build a permanent state in the Carpathian Basin under the rule of the Árpád dynasty known as the Grand Principality of Hungary (Magyar Nagyfejedelemség). This pagan state lasted until the year 1000, when Grand Prince Vajk, the great-great grandson of Árpád, was crowned as King Stephen with recognition from Pope Sylvester II, thus marking the foundation of the Kingdom of Hungary. The gradual migration of the Magyars to the Carpathian Basin from the Ural Mountains. Hungarians are deeply aware of their Eurasian roots and linguistic-ethnic isolation among the predominant Slavic, Germanic and Latin peoples of Europe. 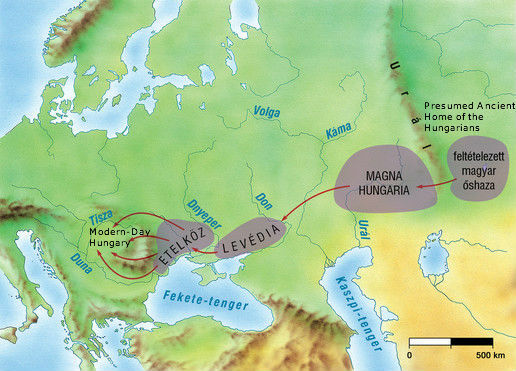 At the same time, Hungarians are very conscious of the one-thousand-year history of the Magyar people in Europe, their close connection to European culture and their religious affiliation with western Christianity. As a result of this dual national identity, Hungarians are inclined to waver between west and east in choosing their political, social and cultural models. After a twenty-year interval in which Hungarians looked primarily to the west for these models, the Orbán government has pointed them back toward the east. This reorientation of Hungary is manifested clearly in the government’s anti-European Union rhetoric and official Eastern Opening Policy. Prime Minister Orbán gave expression to this Asian identity in July 2012 when he said “If there is strength, then there is cooperation. This is the way it is with those of semi-Asian extraction like us” (source in Hungarian). Who wouldn’t want to be related to these guys? Hungary’s radical nationalists reject the Finno-Ugric origin of the Hungarians, reviving instead the notion accepted as fact until the middle of the 1800s that the Magyar people is related to the Huns (source in English). Jobbik President Gábor Vona declared in 2013 that “I am not a Finno-Ugrian” (source in Hungarian). The header of the radical nationalist leader’s personal website reads “We Are the Grandchildren of Attila. We Are Not Afraid of Anyone!” Jobbik has long said that it intends to establish a Hungarian Ancient History Institute (Magyar Őstörténeti Intézet) aimed at revealing the true origin of the Magyars.